A quarter to 2 (ahem, A.M., mind you) and Greek Tutor GT is freaking out. 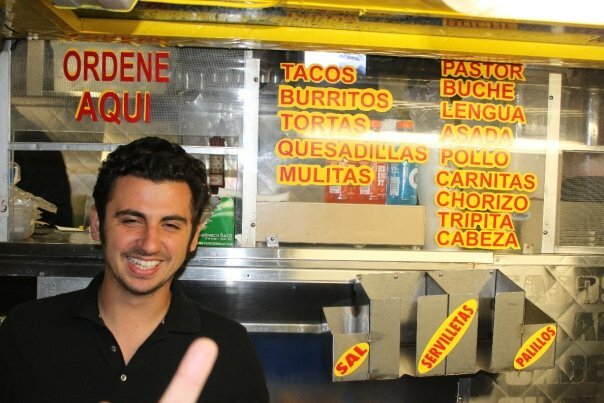 Fifteen minutes until the striking hour when the city's best taco truck, found in a Do-It-Yourself car wash, will close. GT knows. 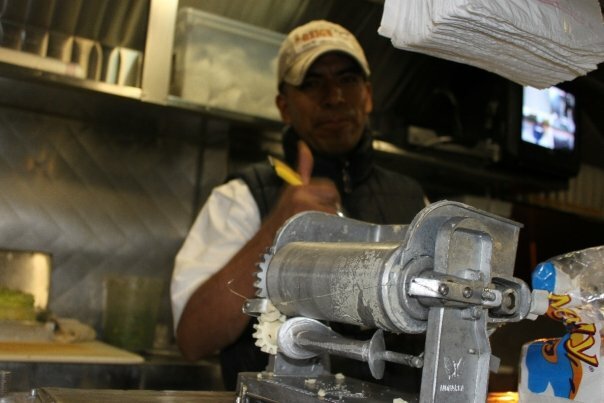 He's had a promiscuous past with the other taco trucks in the city but has since named Tamix as city champ and has subsequently remained loyal. And we all have. 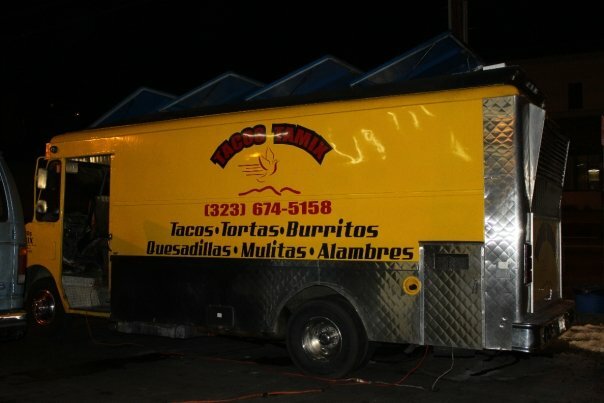 Besides, you wouldn't want to bother trying other taco trucks after the Tamix experience, unless of course it's after 2AM, in which case you are S.O.L. GT breathing sigh of relief after making it before closing. See, Al Pastor meat is analogous to Gyro meat: magically spiced and marinated meat (al pastor being pork-based and gyro being lamb-based) slowly flame cooked on a vertical rotisserie, infecting the air with contagious hunger pain fumes. Only difference, besides being pork-based, is the pineapple on top, whose juices serve as an enzyme, breaking down the meat to further tenderize it. Tamix adds a bonus chunk of pineapple to every taco. Big buckets of fresh salsas, chopped onions, cilantro and pickled veggies are arranged in a DIY formant. Tamix not only has superior al pastor, but incredible alambre: a mess of bell peppers, onions, cheese and meat served with a bundle of foil wrapped tortillas. More DIY stuff and fun to share, just don't get stuck holding the plate. Tamix's meat is on the lean side, I have yet to bite into a suspicious chunk of fat or miscellaneous gelatinous body party. 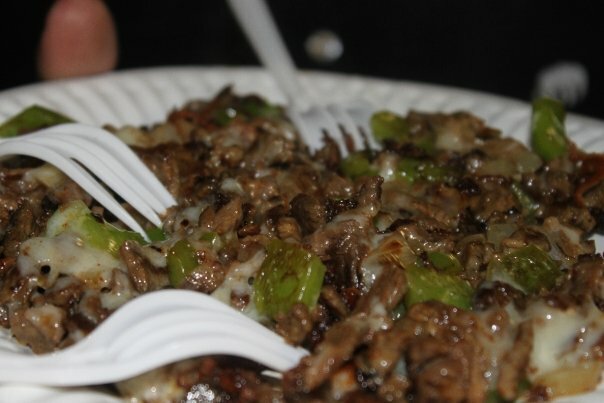 The cheese serves as a perfect binding mechanism to link the peppers and onions with the meat to make a big fiesta in my mouth sans the mariachi. 2: 42 A.M. and everyone is happy. I can't remember the last time I had a taco and it wasn't after midnight! The chipotle is the best here. So smokey, I love it. Gastronomer, Always good times with the GT, my bff! I think the only time I EVER eat tacos is after midnight! Bigzeez, Thanks for that hot chipotle tip! I am with you on the taco eating times. Diana, Yes, a quinoa, ancient aztec style truck is most def needed in LA. Or maybe you can just start a quinoa salad truck? Taco's tamix is the best...but the time I got the al pastor. it was slices not chopped up. Did they rip you off?